There is nothing better than potato salad served in the summer. This is a unique take on potato salad. Instead of just using a mayonnaise or mustard base, why not try it Greek Style. I highly recommend using the Greek Style Yogurt if you have it available in your area. 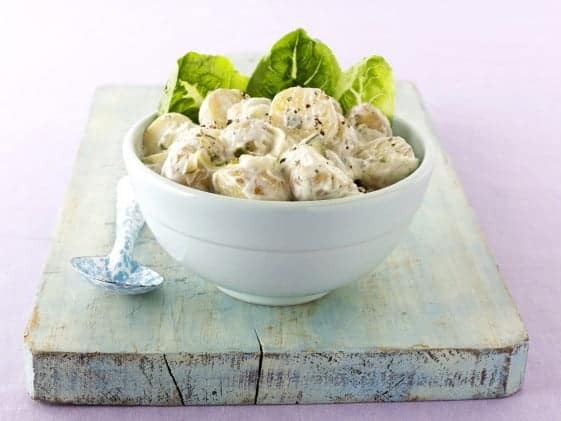 Cucumbers, rich thick yogurt, and fresh herbs make for a new and refreshing style of potato salad. Make Greek inspire Tzatiki potato salad. Bring a large saucepan of salted water to a boil. Add the potatoes and cook over high heat until tender, about 9 minutes. Drain, gently shaking out the excess water. Spread the potatoes on a baking sheet in a single layer and freeze for about 10 minutes, just until no longer warm. Meanwhile, in a large bowl, whisk the yogurt with the mayonnaise until smooth. Add the cucumbers, chile, mint and dill. Fold in the potatoes, season with salt and pepper and serve. For your macaroni salad, do you salt the water after it comes to a boil and also add salt at the end after everything is blended? Is this too much salt or not? BTW – love your recipes. You do an excellent job. The Greek style of yogurt is already strained and pretty thick as it comes out of the container. I love the stuff, it is almost like custard. Hmm, you didn’t strain the yogurt beforehand? That would thicken it up quite a bit without the need for the mayo if you wanted to go a healthier route. Just get some cheesecloth, place the yogurt in the middle, tie the ends to a wooden spoon or something and let it hang in your fridge for about 6 hours over a bowl to collect the liquid. Then do the rest like you said, except without the mayo. Either way, this sounds like something I will be trying at any rate! I’m greek and actually that’s not the correct recipie for tzatziki salad. The greek recipie has no mayo and no potatoes. Most importantly, we add a lot of garlic so as to make it spicy hot, not chillies or pepper. I do have one, click on the share button below the recipe, and it will print out a printer friendly version of the recipe for you.